Competitive eaters have tried it. The “Man vs. Food” guy has tried it. And last night, I Love Memphis tried it. My assembled team of four attempted to take down the 7 lb. Kookamonga Burger at the Kooky Canuck downtown. 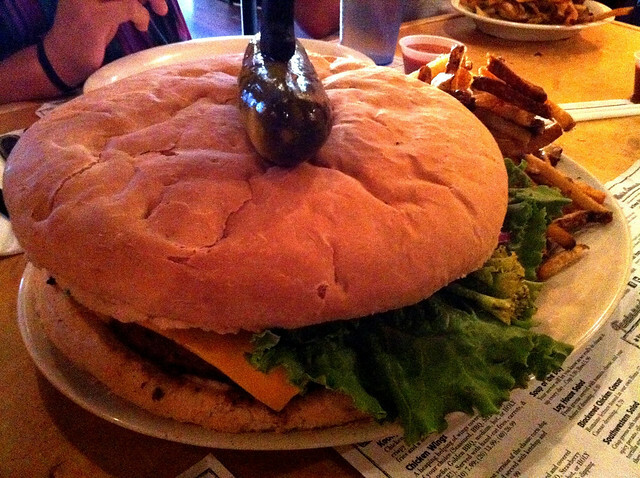 The Kookamonga burger is 4 lbs of ground chuck topped with 3 lbs. of bun, cheese, lettuce, tomato, onions and pickles. It has 12,387 calories. If you can eat the whole thing alone in under an hour, you get the $25 burger for free. More that 3,000 people have attempted it, but only eight have succeeded (with the record holder, a competitive eater, finishing it in 7 minutes and 15 seconds). 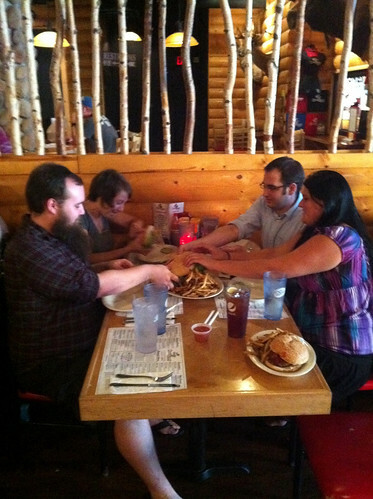 I knew I wouldn’t be able to do it alone, so I assembled an all-star team of eaters. Clockwise from the bottom left, meet Cove bartender Evan Potts, AutoZone accountant (and roller girl) Shannan Fisher, lawyer and Bardog meatball eating contest champion (and contest winner) Dave, and me. The anticipation was by far the worst part of the challenge. Because of its enormous girth, it takes about 45 minutes to cook. While we waited, we discussed strategy. Is eating faster better? How are we going to cut it? Bread first, or the whole sandwich at once? What about the fries? 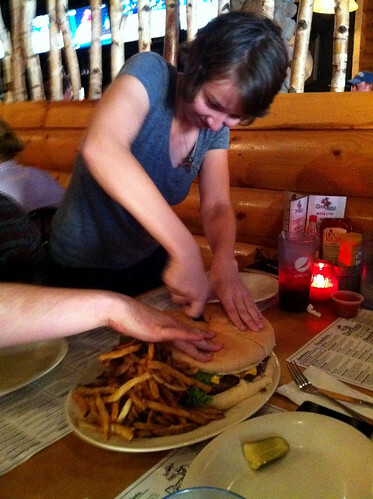 We determined that we would cut the burger into quarters and tackle them individually. If anyone needed help, those who were done could assist. The strategy discussion only lasted a few minutes, though, and we were left to wait. And wait. Shannan got bizarrely nervous (and then felt silly for getting nervous about food). There were pep talks about believing and achieving. Dave kept looking up, expecting the burger to arrive with some fanfare and maybe a long line of people as if it was a free birthday dessert at a Mexican restaurant. And then it came. Our server set it down on the table with a disappointing lack of ceremony, and we set to eating. To the friends of Dave who recommended him for the challenge, thank you. He was definitely our ringer. He finished his quarter of the burger in about 10 minutes and started in on the fries. Shannan and Evan were done in a little more than 15 minutes. It took me a little longer though, and eventually, I had to ask for assistance. Shannan claimed that I had more meat on my plate than everyone else, but I’m blaming it on the fact that I was the smallest person at the table. The last few bites were definitely the most difficult. 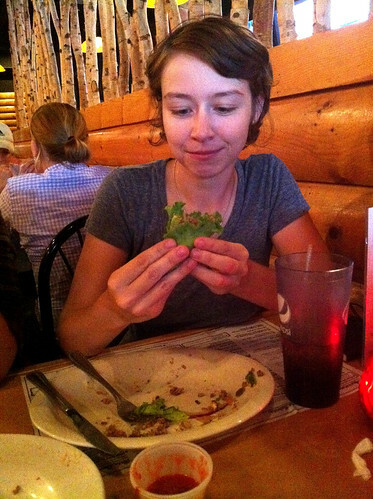 Shannan said that it was hard for her because she ate the veggies and bread first, leaving her with a pile of meat. Evan said that the bites with hardened cheese on them were the worst. I took the last of my burger, a tomato slice and some onion and rolled it up in a big piece of lettuce, spring roll-style. We managed to finish the whole thing in 23 minutes and 46 seconds, which isn’t terribly impressive when you consider that one guy eating alone finished it in less than eight minutes. After the meal, I thought I would get sick. I was worried that I would have flashbacks to the way that I felt after Meat Club. But, I was fine. Incredibly full, but surprisingly fine. I think it’s because I leaned to the left throughout the meal (which my best friend swears settles the food and forces the air out). If you want to take the challenge (or just feed several of people), I recommend calling and ordering your Kookamonga Burger ahead so that the kitchen can have it almost ready when you get there. Now I’m hungry… nice recap of the challenge and kudos for finishing! Thanks for having me! It was great to get to “meat” you and your friends. Plus I had always been pretty curious about the Kookamonga, having never seen anyone order one. I have to say, it was surprisingly tasty, though not nearly as difficult as I had feared/anticipated. I am actually considering going back to give it a shot solo… Shame about the lack of pomp and circumstance upon presentation, but perhaps they make a bigger deal about it if you’re officially trying the challenge? I’ve seen fanfare, they will get everyone’s attention and officially start the clock when someone tries it solo. If Shawn is there, he will be the announcer. Way to go! Great post/narration of the events.